When we arrived in the small town of Luang Prabang in northern Laos we had no idea they had a night market. It was only as we walked down their main street in the late afternoon on our first day there that we learned they had one. 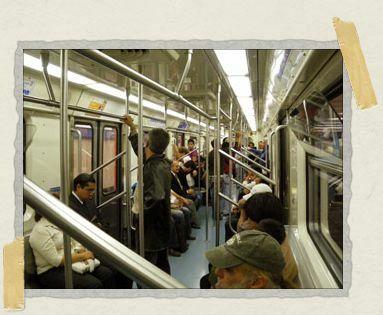 One of the reasons we love Mexico City so much is the Metro. For a city so massive and sprawling, it's astonishingly easy to get everywhere you want to go... thanks to the glorious Sistema de Transporte Colectivo Metro. Given the unsavory (and mostly undeserved) reputation Mexico City has in general, it's perhaps not surprising that a lot of travelers who touch down there are afraid to use the Metro. Rather than drop $0.15 on a 45-minute subway ride from the airport to the Zócalo, they spend 75 times as much to battle the famous DF traffic in the back seat of a cab. Friends, travelers, be not afraid. The Mexico City Metro is no more dangerous than any big-city subway. Jessica and I have taken the Metro around town pretty much every day we've spent there (usually several times a day) and have never felt the slightest bit unsafe. Never, not once, not even a little. Yes, it can sometimes be crowded, especially during rush hour. But crowded sort of comes with the territory when you're in one of the world's most populous cities. And most of the time, it's not all that crowded at all. Yes, during rush hour the front couple of cars are reserved for women and children only. But that doesn't mean that during those times the other cars become a hotbed of testosterone and violence or anything. They're just more crowded, still filled with men and women (and children) alike. Jessica and I don't like to be apart, so we both always rode together in one of the rear cars during rush hour. She never felt uncomfortable or unsafe at all. Neither will you. Yes, I know you've read that you shouldn't take the Metro from the airport because you don't want to ride it with all of your luggage. Ignore that nonsense. As long as you haven't overpacked, no one's going to care. Just take your backpack off and hold it in front of you, both to be courteous and so you can keep an eye on it (there's still a risk of pickpocketing here, as in any crowded place anywhere in the world). The Metro is the best and easiest way to get into town from the airport (see below). Be not afraid. The Mexico City Metro runs daily from 5:00am to midnight (starting a hour or two later on Saturdays and Sundays), and is made up of a number of interconnected lines. Where these lines cross, you can switch (for free) from one line to another. When you enter a metro station, make your way first to the taquilla (ticket counter). Because transfers are free here, there's just one static ticket price. The person behind the window doesn't want to know where you're going, just how many tickets you want. Just walk up to the window and say "Uno, por favor" (or however many you want), and hold up a matching number of fingers in case she didn't hear you. While you're doing this, drop your pesos into the little dish below the window: it costs two pesos a ticket. You'll be given back your tickets and your change. Next, go over to the turnstiles, stick your tickets into the slot (it doesn't matter which side faces up or in, any way will work) and go through. Make sure you don't choose one of the marked card-only turnstiles – they don't have ticket slots. Next, make your way to the andenes (train platforms). They're all clearly marked with the color of the line you're on and the direction it's headed (ie, the name of the stop at the end of the line). Hang out on your platform waiting for your train – they come by every five or ten minutes, so you won't be waiting for long. Note that if it's rush hour, there may be a sign saying Solo Mujeres (Women Only) marking off where the women-and-children-only cars will be. If you're a man, and you wait on the wrong side of this line, a police office will make you move to the other side of it. When your train comes, let exiting passengers escape and then pile on in. If it's rush hour, you may have to squeeze in a bit, but otherwise you'll probably be able to grab a seat. The Mexico City metro trains are pretty much exactly what you'd expect to find in any American or European city, except that they aren't air conditioned. (Open windows tend to keep it pretty cool, though.) You'll be surrounded by men and women in suits on their way to and from work, teenagers making their way home from school, and parents and children out to run a few errands. Women and children will be everywhere. Unless you're taking the Metro in the dead of night (in which case it will be pretty quiet), you will feel completely safe. I promise. Now, along the way you'll be provided some free entertainment. Hawkers will wander through selling pens and flashlights, food and candy. CD vendors selling discs of pirated MP3s for less than a dollar wear backpacks stuffed full with speakers, and wander through blaring Pink Floyd and Enya. They'll generally get on at one stop and off at the next, only to be replaced by someone else the station after that. When you get to where you're going, exit the train (look out for impatient people squeezing onboard before you've had a chance to get off!) and look for the salida (exit). There will usually be a few exits from each station, often putting you topside on different sides of busy, hard-to-cross streets. Look around for the helpful maps in each station showing where the exits come out. Once you've touched down at the Benito Juarez airport, gone through customs, and grabbed a few pesos from an ATM, make your way out the main doors at the end of Terminal 1. From here, follow the crowd to the left. After a 5-minute walk or so, there will be a path branching off to the left. You might miss the Metro sign (which is just the stylized "M" at the top of the PDF above), but you won't be able to miss the fact that everyone else is taking a left here. Stairs a few feet away lead down into the Terminal Aerea metro station. As described above, walk up to the taquilla and buy your tickets. After going through the turnstiles, make your way to the platforms heading in the Pantitlan direction. Jump on that train and take it for two stops, to the end of the line: Pantitlan station. Get on a train headed to Observatorio, and take it for nine stops, to Pino Suarez. From here make one more switch, to the Blue Line headed towards Cuatro Caminos. On the way from the Pink Line to the Blue Line you'll pass by a frequently-updated art exhibit of some sort, and an enormous Aztec column they unearthed while building the station. Take the Blue Line towards Cuatro Caminos for one stop to the Zócalo station, and then make your way to the salida and up to the surface. Congratulations! You've taken the Metro from the airport to the heart of El Centro Histórico. And now that you've successfully taken it once, you're probably addicted to how easy it is, and how much it will aid you in navigating this wonderful city. 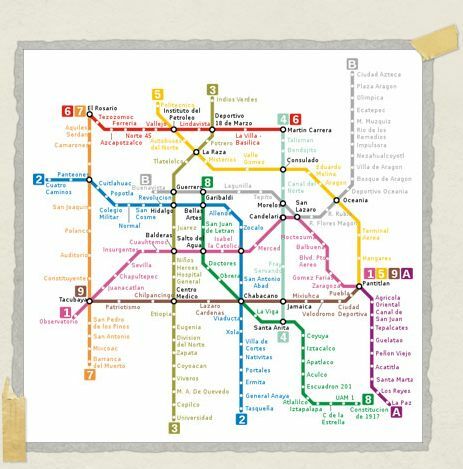 I had no idea the Mexico City subway was so comprehensive. You're probably right, though, about the city's unsavory reputation driving tourists to far more expensive and probably more time-consuming methods of travel. That said, the women only signs worry me a bit. I'm not crazy about some parts of the NYC subway system at night, and that's the devil I know! That said, the women only signs worry me a bit. It was a bit strange to me when we first read about it too, but given how incredibly safe the metro feels, I think the women and only children cars might be more about making more room for kids (than, say, a safer zone for women). During rush hour the cars get so incredibly crowded (as you can probably imagine from your time in NYC) that the little kids in the regular cars have barely any breathing room. Couple that with more people rushing in and out of the cars, and I think the little ones might have an increased risk for being accidentally squished in the regular cars during rush hour. Yikes! You may be interested in my site, which is all about the Mexico City Metro system. It's not completely finished yet, but it's getting better by the day. You can find a couple of printable maps on my Maps page (which include the individual station logos). I'll be updating it soon so that the PDF will be smaller, and will include the Tren Suburbano. There's also a map of the Metrobus. I hope you like it! 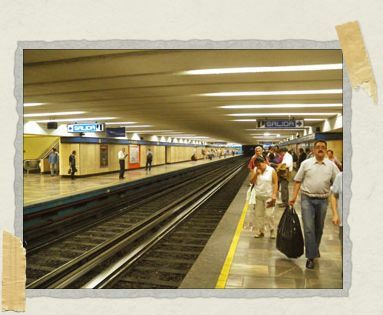 We absolutely love your Mexico City metro site. It's awesome! Compiling all that information must have taken quite some time; we're both really impressed. It's definitely going to be a great resource for anyone traveling to Mexico City. Thank you so much for sharing it with us! Just wondered onto your website as I needed some info on how to get to the Zocalo from the Airport. So I just wanted to say a BIG thank you. I'm on a 9 month trip through Central and S. America next month! A truly lovely website – a real pleasure to read. Thanks so much for the kind words about our website. We're so happy we were able to help. Have a great time in Mexico City, and on the rest of your trip! Thank your for excellent info on how to move around using the metro. originally i was thinking of using taxi from the airport but after reading your blog i immediately change my mind and will be using the metro. its seems straight forward and easy. Great job on ur part.. Thank you so much, Mohamed! We're so happy to hear this post was helpful. I think you'll find the metro in Mexico City very user-friendly (and much less expensive than a taxi too!). It's a really fun way to get around. Have a great trip! Mexico City just might be our most favorite city in the world to date. I actually read this guide before I went to DF earlier this year and it was a big help. I took the metro almost every day except for when I took a hostel tour to Plaza de las Tres Culturas/Basílica de Nuestra Señora de Guadalupe/Teotihuacan. I think I saved a lot of money using the subway and the only time I had trouble was getting a bit lost after visiting Coyoacan. I *did* get groped once on my first day while entering the Zocalo station, but other than that I felt quite safe and always went to the front of the subway, even during off-peak hours since there always seemed to be a lot of women up there! Funnily I don't think I saw a single other tourist on the metro. It's too bad because it can really help get you centred in the city and get a sense of life in one of the biggest cities in the world! It certainly was busy, but I didn't feel anymore crowded in the station than, say, Berlin, and although seeing the machine-gun armed police standing above everyones head for the first time was a bit unsettling, I felt quite safe in the end! I'm so happy our tips were helpful to you! We'll actually be heading back out to Mexico City later this year, and we can't wait! The metro there is maybe my favorite transit system in the world – it's certainly one of the most convenient, especially given how incredibly cheap it is. That's horrible that you were groped there, though, I'm so sorry to hear about that. What an awful thing to happen, especially on your first day. I'm so impressed that the experience didn't sour you on the Metro altogether, and I'm so happy that things went better after that. Go you for not letting one sick jerk ruin it for you! That's a great tip about riding up towards the front, even during off-peak times. Thanks! The reason for the women & children only cars during rush hour is due to groping..yes its true. I like to ride the metro & its a great way to get around Mexico City and beat traffic. I can imagine people who aren't used to being on public transit or are afraid of an 'attack' might find it a threatening experience at times.Walk tall. I will be arriving in Mexico City on 11-18-2012 around 2:30 pm. I would like to know if the metro line from the airport to downtown is crowded on the weekends. Hi Rob! Thanks so much for your comment and congrats on your upcoming trip to Mexico City. We absolutely adore it there! When getting on (or off, for that matter) at the airport stop, we've never found the metro particularly crowded on the weekend or during the week. Most times we've been able to grab a seat without any trouble. It can get (sometime very!) crowded the closer you get into town and at the major transit exchanges. So make sure your bag(s) are small and easy to manage so that you can enter and exit most efficiently. Plus, some of the metro stops involve a lot of walking when you need to change trains, so small bags help there too. You guys rule. Rock on with your bad selves for making this site. So we have a super long layover at MEX and thought we might try and get to the Zocalo. Question. If we're coming into Terminal 2, is the Airport stop still the closest or does it make more sense to go to Panitlan? Hi Graham! Thanks for the nice words! When we've flown into MEX, it's often been through Terminal 2. We've always taken the airport Skytrain over to Terminal 1 and then followed the instructions above. It's one of those things we'd never even stopped to question. Looking at a map, Terminal 2 is so much closer to Pantitlan that now I'm shaking my head at how far out of our way we've always gone in the past. If we were flying there tomorrow, and flying into T2, then I think we'd head straight to Pantitlan rather than going back to T1 first. It looks like it's only a 500m walk, but we've never actually done it ourselves so I can't give you any info on it. But that's what we'd do. Very helpful info. Went to the blog because we're gonna have a layover at MEX (on the way to Merida), me and my daughter and were looking to head over to the Zocalo and see it. Any restaurant recoms for lunch around there that ain't super expensive? Is there any concession for old folks. I am 81 and not as spry as I once was. My first trip to mexico city and I took a taxi to get on an ADO bus…they charged me $40 american. The last time I went I asked about the metro, an older gentleman told me I could walk the 12 or so blocks. Easy walk safe neighborhood! Cost to get to ADO autobus 5 pesos(less than 50 cents) as opposed to $40 american dollars! Got a question though…what is the name of the station I walked to?!?! Also, I met a fantastic redhead who owned a BOOM! store at that station. I lost her contact info, wondering if you pass through there and could forward my info to her. I lived in Mexico City for many years. Currently back home in UK for a while. I have to say that it is one of the safest cities I have ever lived in. The people are friendly and generous. Yes there is an underworld in Mexico as there is in every country, but not much in this city. I can�'t wait to go back to my beloved DF. I really have never been happier in my life then when I was in Mexico. I agree that DFO's metro system is an amazing, and that you will shave off many hours and pesos while getting an expedited lesson in the lay of the land. But FYI, the 'ladies only' cars are there for good reason– I travelled the metro often for 2 weeks in 2015, always with my boyfriend. I was groped 2x, always when it was so crowded that I could not distinguish who the offender was. I'm a middle aged woman and not a provocative dresser, so I was surprised to be targeted (it would appear that they are not picky). While such incidents are not what I would consider to be dangerous, it is really gross and something that travelling females should be aware of. Thanks for the info! I will be in town for the first time next month and planned to walk or use uber only. I may try the metro.